WHERE ARE CICADA KILLER NESTS? Cicada killers are the among the largest in the wasp family. Known as sphecius speciosus to entomologists, cicada killers get active in the summer and will frighten most anyone they confront. Cicada killers are most black with some yellow stripes and grow to be over two inches long. Cicada killers will dig their nests throughout the yard, mulch and sand areas and will generally frighten anyone who sees them. Like most wasps, they can sting. They use their stinger to sedate and paralyze cicada’s. Cicada killers will hunt cicadas during the summer months when populations are active. They will find a cicada, sting it and bring it back to it’s nest. 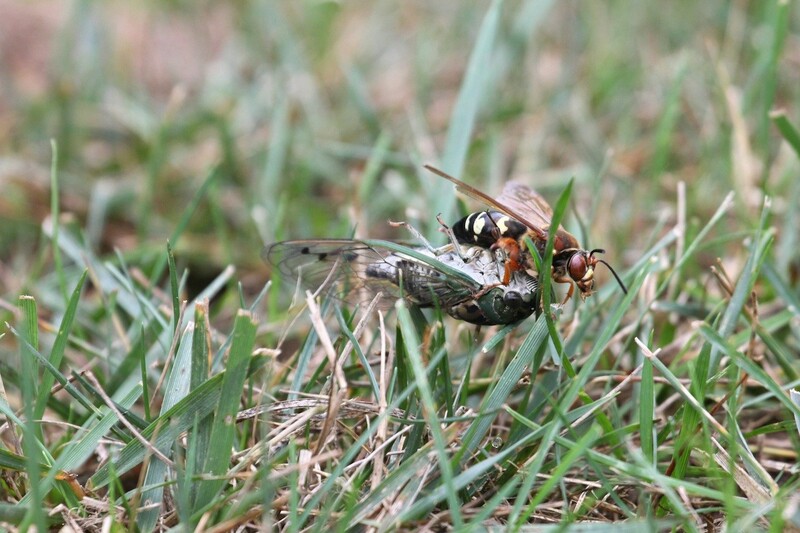 This short video shows a female Cicada Killer in action. Once the cicada has been pumped full of toxins and rendered helpless, it will be brought back to the burrow where the paralyzed cicada will serve as food for the young cicada killers. Most egg burrows will have one or two cicadas for every egg which is laid. And most nests usually only have one egg chamber but when populations are high, cicada killers will dig extra chambers or extra nests to accommodate reproduction capabilities. This will vary from year to year as the cicada population varies. Old folklore states that cicadas are active every 7 or 12 years, but in fact some will emerge every year – depending on the region. Cicada killer populations will vary depending on the hatch or release of cicadas. In general, the more cicadas, the more cicada killers. 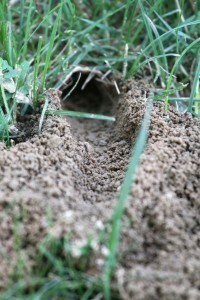 Cicada killers are a nuisance around the home because the dig large nests which are unsightly. These nests are sometimes thought to be from an animal because they are so big. Cicada Killers will spend their days foraging and if you watch the nest, you may catch them entering or leaving as they go about their daily habits. Since cicada killers are so large, most people are petrified of them. In fact, cicada killers are generally not aggressive but you should ignore them and certainly you don’t want to irritate them. Stay clear of nests and be sure to keep children away from them as well. Since the nest will not go away on it’s own and will probably be active from year to year, it is best to treat them as soon as you see it developing. There are several ways to do the treatment and the method you choose largely depends on how comfortable you feel doing the work, whether you see the nests clearly and how many nests you have. If you have one or two holes and are only seeing one or two adults, getting control should be easy. Use WASP HORNET FREEZE for a quick knockdown of active. Stand close to their nests and spray the adults as you see them entering or leaving a nest. Wasp Hornet Freeze uses a unique combination of actives which work well on wasps even as large as cicada killers. Be careful of less expensive over-the-counter aerosols. Many of these formulations are not strong enough for this type of wasp. Once the adult has been sprayed and is dead, watch the nest for a few days. If no activity is noted, you have probably solved the problem and should seal the hole. If you see new activity the following year, you will need to go to the second treatment option to insure they don’t come back. The second treatment option is to use a liquid concentrate. You may want to employ this method if you are afraid of treating with Wasp Freeze because you don’t want to get close to the nest or if you have several nests that need to be treated. Liquid treatments should be done at night so there is little risk of conflict with adults and to insure all adults are inside. The big advantage of using a liquid treatment is that it will provide residual in the hole. You’ll need this residual action if you wish to kill the larvae which will be hatching later in the summer. This is critical for chronic infestations and one of the main reasons problems persist from year to year. For this need, CYPERMETHRIN is your best bet. Its highly active on cicada killers providing a quick knockdown. And it will last 2-4 weeks in the soil working on hatching larvae. Since nests can be large with more than one egg chamber, you should treat each hole by applying at least 1/2 gallon of mixed solution. This insures proper coverage and distribution throughout the chambers. Use 1 oz per gallon of water and remember to treat close to dusk. 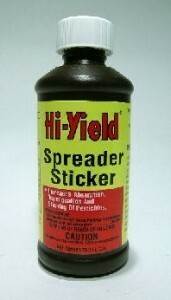 To help affect the cicada killers faster, add 1 oz of SPREADER STICKER with the Cypermethrin. Spreader Sticker helps the cypermethrin to “coat” target pests that much faster which is important when targeting large insects with hard shelled bodies. Drenching the nests can be done by pouring the mixture down the holes with a bucket. But using a good PUMP SPRAYER with the tip set to pin stream is a better way to proceed. This way you don’t waste any spray and you’ll be able to spray non stop till you know you’ve applied at least 1/2 gallon per hole. No if you’re unsure where all the nests are located (which can happen when they burrow in mulch or under bushes), you’ll need to use a different active. 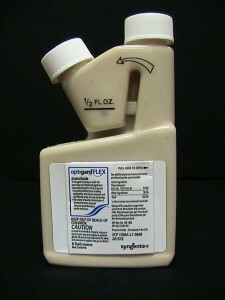 This product is known as OPTIGARD and is known as a “non repellent” which means the target pest won’t know its present. This feature insures they’ll readily walk over the treatment and in doing so, pick up a lethal dose which will eventually kill them. You can use the pump sprayer above to broadcast the treatment or it can be done using a HOSE END SPRAYER. You will first need to see where they are most active and then try to distribute 1 gallon of mixed material per 100 sq/ft of area. Thats about a 10′ x 10′ section of turf. Optigard can be sprayed on turf, mulch, flowers, shrubs, etc. Keep in mind it will take 3-4 days for target pests to die and we suggest applying 1 gallon per evening until the activity stops. This usually takes 3-4 days. Mix 1/2 oz of Optigard per gallon of water and remember the treatment will take a few days to work. For large areas, a good Hose End sprayer might prove easier to use over a standard pump sprayer. Again, this method of treating a large area is more of a “shotgun” approach and will not kill adults immediately. It usually takes several days for them to die but as they move over the small amounts of active applied, the exposure will eventually kill them. TO INSURE POSITIVE RESULTS, TREAT DAILY TILL ALL ACTIVITY STOPS. No doubt the fastest results and quickest killing action can be achieved by dusting active holes with DRIONE DUST. This method is fast acting and only takes a few seconds to do. Treat at night when all the nest occupants are sure to be inside. Approach nests quietly (bring a flashlight if you cannot see the nest clearly) and make sure you know how many holes are present so you’re prepared to treat them all in one visit. Drione goes a long way. The small 6 oz jar is enough to treat 25-50 nests and the 1 lb jar is enough to treat 100-200 nests. Drione works as a dessicant which means is till dehydrate affected adults immediately. You’ll need a HAND DUSTER to make the application but they’re easy to use and will enable you to deliver the dust quick. Each hole should receive 3-4 heavy puffs of Drione so you’ll only be able to treat 4-8 holes per filling of the Hand Duster. Drione works quickly and it “floats” well inside their nest meaning it will surely get down deep and penetrate every area insuring all occupants will eventually die – including the developing young. As for the active adults; once the Drione covers them, they’ll be dead within a few minutes. The following video shows how to properly dust a cicada killer nest. The day after you dust watch the treated nests from afar and if you spy any that still have activity, plan on treating them again later that evening. Its easy to miss a few nests if you have 20 or more to treat so expect to do at least 1 followup. This is very “normal” since they could easily have hidden nests. But if repeat your treatments nightly, all activity can be controlled in just 2-3 days no matter how many you have. One big benefits of using Drione is that the dust will readily absorb cicada killer odors and pheromones. This is important for preventing new nests. Since we know foraging cicada killers are always looking for good nest locations, once your yard has 3-5 nests in the ground it will be more likely to attract new adults searching for a good location to tunnel. This happens because existing nests release smells (undetectable by humans) which other cicada killers can detect from long distances away. And once they “smell” your yard as being good for nest building, they’ll target your property. This is one of the main reasons nests tend to appear in the same area year after year. But dusting with Drione can effectively diffuse these scents which will prevent new cicada killers from finding your yard. So for long term protection, dusting with Drione has big advantages. Remember that cicada killers who have already laid eggs means there is a good chance you will have activity the following year if you don’t treat active nests properly as detailed above. This can happen because it’s hard to reach the eggs that are buried deep in the ground and without being able to directly treat them, chances are high the eggs will be able to hatch safely and feed without a problem since they’ll have their required food. Using Drione can take care of these remote eggs. But its easy to miss nests not used and cicada killers will often times ignore or stop using nests filled with eggs and move to new nests as the season wears on. Additionally, once a good nesting area is located, adults will try to use such ground from year to year due to a lingering “scent” or “pheromones” in the area. This means any that emerge in your neighborhood will naturally be drawn to your nests looking for mates, good ground for new nests, etc. For this reason it’s important to treat previous nest sites early in the spring, at least once, with liquid applications of Cypermethrin or the granules listed below. So even if you believe you succeeded in killing off previous nests but want to make sure no new nests form, treat the entire yard with ADONIS once all activity is controlled. This should also be done in the following spring prior to them getting active again. Adonis uses a slow working active that is great for preventing a range of pests that like to nest in the ground. Commonly used to control lawn grubs, broadcasting it over the grass and mulch will put in place a treatment that will stop all developing insects who might use the treated zone. And since applications will last 3-6 months, its a great way to keep your turf, shrubs and trees healthy. Using it at a rate of .5 oz per 1,000 sq/ft, treat as much of the yard as you can after controlling the current activity. Adonis will then soak into the ground and kill off developing larvae you miss. This in turn will help keep the yard free of new nests the following year. The small jug will cover over an acre and should be used once after the current activity is controlled and then again the following spring. Use a good HOSE END SPRAYER to make the treatment. 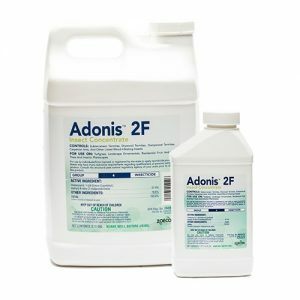 With our sprayer, you’ll need to add 2.5 oz of Adonis to the tank and then fill it up with water to the 5 gallon line. This will be about 1/4 of the way full and this amount will allow you to treat 1/4 acre. In summary, the best chance of preventing Cicada killers from returning to your yard is to dust all current holes with Drione and then once the current activity ceases, spray Adonis over the turf to kill off developing grubs. Spray Adonis the following spring too so if new activity starts, the treatment will kill off these new visitors too. We have these killers really bad. How much of the two mixtures do we add together; the speader sticker and cypermethrin? Go with 1 oz of the Cypermethrin and 2 oz of the Spreader Sticker per gallon of water. Use 1/2 to 1 gallon of the mixture per hole you treat. Is this safe for pets to be around? My daughter has a nest of these under her cucumber plant. Is there anything organic and safe she can use to get rid of them? She doesn’t want to use anything chemical for fear of contaminating her vegetables. We’ve got two organic options that are safe for vegetable gardens and plants. So if she wants to treat with a dust as explained in our article above, she can use the Diatomaceous Earth with a Hand Duster. It won’t pose any kind of hazard to the plants. But if she prefers to spray, go with the organic Multi Purpose Insect Killer. It has just one day to harvest and can be used on the plants as well as the cucumbers so again, it’s perfectly safe for soil treatments too. We have an above ground pool that the cicada killers have made their nests under (right into the sand). How do we kill them in the sand? We do not know if liquid solutions are drying up before it soaks into the sand and before it will reach the bees? We have been spraying wasp killer on them as they fly. Some die but we have so many it makes it unbearable to be at the pool. Our pool measures 27 x 13 and one side is sand and the other is mostly dirt and they like the sand area. As our article above explains, the “freeze” method of treating is not an efficient method to use when you have a lot of nests. And you are correct in thinking that liquid treating sandy areas may not work. In many cases the liquid won’t get down to where it’s most needed. But what will work is the Drione Dust. It’s ideally formulated for these type of nests. And you’ll get fast results. If you treat every hole you see at night, the next day you’ll be cicada killer free if the holes were treated properly. Go with this treatment method if you want to get rid of this pest for good. I’M SCARED OF THE DAMN THINGS. CAN I JUST PLANT SOD OVER THE NEST? MY BACKYARD HAS LITTLE GRASS SO NOW I SEE WHY I HAVE THE NEST IN MY YARD VS MY NEIGHBORS. Of course you can put sod over the top of the nests. But if you are thinking that this will affect them in some way you are wrong. They’ll merely chew through the sod within minutes and be right back to their normal day to day activity. In fact, they’d no doubt like the sod since it will protect them more providing shelter from the sun and rain. So if you decide to lay any down and you have nests that are active, be sure to treat first with the liquid or dust spray listed above. This way they won’t start chewing through the costly grass. Just this week we have noticed several wasps going under our lower deck in between the slats. It happens to be near our above ground pool and back door. The dogs don’t care for them either. We have killed 4 but 2 more have replaced them. Will above methods work for under the wood slats? It can. But as our article explains, you really need to get the treatment into their nests. With that being said, I suggest you lift some of the slats to get a better view of where they’re going, if there are nests reachable, etc. and then directly treat as many as possible. Now if the slats are close to the ground, dusting through them could get enough of the Drione into the nest because it will float around quite a bit when applied. In fact, it can drive several feet and this could be a viable way to treat the area “blindly”. But you’ll have to pay special attention to where they enter and then apply the dust directly to that spot. If that’s where the nest is, you could very well take care of them this way. I have about 5-6 holes/nests within 5 feet of my house where we spend time outside. I’m terrified of them and so are my kids. I get them every year and more each year. How many bees are in each hole? Generally one to three per hole. And as our article above explains, if you don’t start treating it will just get worse and worse. In fact you do not want to water but try to keep the area dry as long as possible. In most cases the treatment will do it’s job in an hour or less. And since the dust should be going down deep into the hole, moisture around at the entrance of their nest and on the top soil will take awhile to penetrate enough to have any impact. That being said, if you have a heavy rain just after dusting and note activity the day after treating, treat again with the Drione. We have 9 nests right around our pool an a dog and a 10 year old daughter. They swarm around us and I don’t know what to do. I suggest you read the article above and either liquid treat with the Cypermethrin or dust them with the Drione. Both options work well. Last year we had several cicada killer nests in our yard. My husband treated them with delta dust and presto, they were gone almost overnight. This year they returned and we only found 2 nests (which he treated) but still have tons of cicadas swarming around our backyard. We also noticed that some were starting to hang out in our front yard. What do we do to get rid of them if we can’t find anymore nests? I’m scared to be outside with my 2 young children. The next best thing to do when you can’t find their nests is to treat the ground or other areas where they are seen with Cypermethrin. It can kill them if they land on treated surfaces enough and if you spray their nests, it will get them over time too. Also, it will work on the cicada’s as well. Safety precautions for pets and humans if I use the Drione dust over a large area. First and foremost, everything listed above in our article can be used safely around people and pets. In fact we have safety videos on every product page which goes over most everything you’ll need to know regarding general safety guidelines. Additionally, Drione does not require any special preparation or followups after being applied and in general, just keeping pets and children away during the application is all you need to do to use it safely. And within an hour (longer if you want to wait to make sure the target pest is gone), everyone can return to the treated area. More importantly, Drione should be applied directly into the nests of the Cicada Killers to get the best results. That being said, it is labeled for use over lawns like one would apply a lawn granule. Now in our opinion that would be wasteful since you don’t need to use it this way to get control of cicada killers. But the point is you can use it this way safely with no hazard to people or pets and therefore, if you apply it directly to the nests as you should for cicada killers, there would be little or no exposure to people or pets and therefore no risk or hazard presented. We have cicada killers flying around and burrowing in the sandbox at our daycare center. There does not seem to be a nest any where in the area. The children love to play in the sandbox! Are there any “home remedies”/non-toxic of course that I could do to get rid of them? I am really uncomfortable with spraying or dusting the area with the kids playing in and near the sandbox area. Any help you could give would be greatly appreciated! First, the “burrows” you see are in fact their nests. Second, the sting from these wasps can be a problem so they must be controlled to avoid conflict with the kids. Third, treating playgrounds and places where kids are playing falls into the category of “sensitive areas” which means that only the safest products should be used when pest control treatments are needed. And for that need, the Essentria line is the only way to go. Made from food and plant oils, these federally exempt products pose no hazard to people or pets. Review the label yourself and you’ll see the product can be applied at boat docks around water, in schools and even playgrounds. Essentria has this liberal label because once mixed with water, it has such a low impact on the environment that it can be used safely when treating sensitive areas. The good news is that it can still control a wide range of pests even though it is so safe. So in this case, I would mix up 4 oz per gallon of water and pump one full gallon per burrow that’s active. I’d repeat this daily until I saw no activity the following day. So if you treat one evening and note that half the burrows are quiet the next day but half still have activity, treat the active burrows a second time. Repeat this process until they’re all gone. Essentria is labeled for use as a soil drench and won’t pose a hazard when used this way so the kids will be okay to use the area the next day after you treat. And once the cicada killers are gone, the kids (and you) won’t have to worry about getting stung anymore. I have seen and treated similar scenarios for this pest. In the cases I’ve handled, the sheds have been resting on the ground or close to it with access to the space underneath most commonly made at the entrance way to the shed. Some of these sheds have two swinging doors; others have normal single doorways. But in most all cases, there is a floor board and a slight space which is an ideal place for many pests to nest. And once they gain access to such a small space, it can be tough to treat. What I’ve learned is that the Drione, because of it’s “smoke” like nature, can do the job. But it will only work up to 100 sq/ft. So if the entire shed is 10 feet wide by 10 feet deep, you should be able to get it properly dusted from one spot as long as the space underneath is fairly open to allow the Drione to drift about. If you watch the Drione video, you’ll see that it’s very light and will carry a long way so as long as that space is open, you’ll get the needed penetration. Now the way you want to approach this kind of job is to use a Hand Duster and pump the Drione making sure to get about 6-8 oz per 10 x 10 area. We’d then let it sit for 1 week we’d get the desired results. But if we still found activity, we’d request the floor be cut up so we could direct treat using either Drione or the Cypermethrin. So I would say to try the same approach because it will work; if the shed is 10 x 10 or smaller, the small sized Drione would be plenty. But after a week if you still see them flying around, opt to open up the area so the nests will become accessible and a direct treatment easier to make. We have been seeing two cicada killers flying around and they are going in and out of a crack that is under the cement steps that go into the front door of our house. We have captured the two adults females and are observing them with NO intent of releasing them. What would be the best method to use to treat the nests that are most likely under our steps? We can’t move the steps but there are areas around the steps with cracks that we could possibly spray bug killer into. Any advice would be helpful. We LOVE our cicadas and look forward to watching them every year as they hatch and dry their beautiful wings. A week ago I heard them singing in our trees and now we don’t hear any. I want these cicada killers gone! This sounds like a great place to employ the Drione Dust. Light and smokey, it will surely penetrate all the way into the hidden voids under the steps when applied with a Hand Duster. And once it permeates this area, any developing young or adults that try to move in the treatment will die. Just a compliment for tech support. Fantastic job explaining the proper methods to treat. Because of this site, cicada killers go the other way when they see me coming:) Thank you! We have these by the hundreds in my wife’s riding arena (110′ x 160′). What do you recommend for treatment of an area this size? The arena is sandy about 6-10″ deep. No doubt dusting the holes with Drione as explained above would prove to be more efficient compared to spraying. If you hit the nests in the evening, you should be able to knock most of them out instantly. After the first treatment, expect to do 1-2 followups to get the ones you miss. This happens most times; especially when there are a lot of nests to treat so it’s normal not to get them all at once. But the Drione is quick and efficient over the spray for this type of treatment. I have them in behind the siding of my house right under the edge of the roof. How do I get to them to get rid of them? Does permethrin work as well as cypermethrin in the treatment of cicada killer wasps? I have permethrin in the form of guards tar ground drench as I am a hobby beekeeper with 15 hives and I use it for the control of hive beetles. Sorry but no. For the same reason that Permethrin can be used around bees safely it’s just not strong enough to effectively deal with Cicada Killers. In fact, Cypermethrin is a “newer” generation of Permethrin. Closely related, it’s made from the same base chemical chain with the main difference being that less of it is needed for target pests. But even Cypermethrin is barely strong enough on this pest and really, the Drione is the best way to go if possible. We have 2 big guys flying around our sidewalk and our neighbors driveway. We see them disappear under some crab grass but we can’t see any holes. This is the first year we have had them and we are scared to death of them because we have 3 small children. If we use the above mentioned methods but not know where the exact point of entry is will it be successful? We are doing the 50 yard dash everyday from our front door to our vehicles. If you can narrow the location where they’re active to just a couple of square feet, you should be able to have success even without knowing exactly where the entry hole is located. So lets say you know the spot is somewhere in the range of a garbage pail cover, that would be small enough to achieve success even without knowing the exact entrance point. 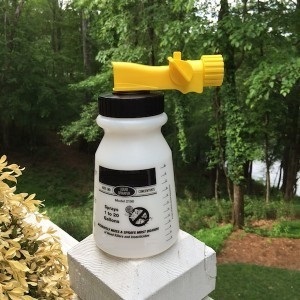 So if you’ve got the location narrowed down to something that small, you can attack them with the Cypermethrin by mixing and applying 1 gallon over the spot every evening. Now understand it will most certainly take more than 1-2 treatments to get them all but if you apply 1 gallon to this spot for at least 3 nights in a row, you should be penetrating the ground well enough to insure they’ll die. Now I have seen where 4-5 treatments are needed every now and then but that would be extreme and usually involves cases where there are 10-20 cicada killers nesting. Since you’re only seeing 2, I’m sure less will do the job. I have purchased the drione dust and a duster. I watched a video about how the drione dust works and it was mentioned that one of the components irritates the pest it contacts. If I dust the holes at night, will the irritation the dust causes have the cicada killers flying out ready to sting? When done properly, so much dust would be applied to the nest that the cicada killers won’t be able to leave quickly because they’ll be caught off guard and totally covered in dust. This will many times cause them to die in their nests but in cases where they might eventually crawl out after being directly dusted will take a few minutes. That gives you plenty of time to clear the area since the time needed to dust is just a few seconds per hole. Where can I purchase the Drione Dust? Drione is a specialty product that’s won’t be located in retail shops. Order it on line through our site; we ship within one business day. In getting rid of Cicada killers, I saw where you mention to another person that putting sod over top of them won’t stop them because eventually they will chew right through the sod. How about applying mulch? Laying weed fabric on the ground and over nests then laying mulch down over that. Shouldn’t this method rid the cicada killers at least over time? If you have established nests, neither mulch or weed fabric will help. Here’s why. Wasps have powerful chewing mouth parts and can chew through most anything. We’ve seen active nests chew through thick plastic that was laid down over them and in the end, the only way these nests were controlled was by treating them with either the Drione or Cypermethrin listed above. Additionally, once an area gets nests, there are certain pheromones that will linger. These scents are nothing you or I can detect but to cicada killers, they’re powerful smells that indicate things like good nest site locations. That means your land is naturally attracting this pest all the time and one of the main reasons why you typically get more and more nesting every year. Now if you treat your existing nests with one of the methods mentioned above, let it stand for a day or two to make sure it’s dead and then cover it with some weed fabric, the chances of it getting new nests will be reduced. Just don’t cover it up and think the problem will go away because they’re way too strong for this approach to be effective. I live in Connecticut and it seems we are unable to buy any of the listed treatments. Can you ship to CT.? If not then is there a CT-acceptable alternative? We have multiple nests outside the front door and they have totally succeeded in freaking us out. Thanks. If you wish to liquid spray, we have several options. One is Permethrin which is closely related to CyPermethrin. You will need to mix more per gallon so instead of just 1 oz you’ll need to use 4 oz. And if you’re wanting to cover a large area via a hose end sprayer, get the Cyonara RTS. I’ll tell you one thing, people will tell you they don’t sting…..for sure they are WRONG! I’m nursing a massive sting this morning from one of these cicada killers and it is VERY painful!! Thanks or sharing. The one thing we have found is that anyone who tells us they don’t “sting” is someone who has never been stung. I guess that only makes sense. But since I’ve been working with insects for over 30 years, the one thing I know is that any insect species which has a stinger can in fact use it at any time. And if you happen to be in the way of that stinger when they decide to use it? Well, you’ll end up feeling it’s wrath. Not surprisingly, we hear this a lot regarding snakes and spiders. The common comment is “you don’t have to worry about that snake (or spider) because they’re not venomous”. Well, rest assured, if it’s got jaws and teeth, it can bite. And just because it doesn’t have venom it does not mean the bite the will go un noticed. Just try and grab a water snake and see what it will do to any unprotected skin you have within striking distance! Same with Wolf spiders. They have powerful jaws and their bite will leave a nasty mark. The moral of the story is you should avoid contact with insects and animals to avoid getting stung or bit. And that means keeping their populations minimized in and around the home is the way to insure you don’t cross paths because really, it’s just a game of numbers. Less conflict, less chance of getting bit or stung. Tech Support–I had a large number of of cicada killer wasp nests during August, but they seemed to have become inactive. I can still see the entrances to the nests. Should I treat the nests with Drione dust at this time or wait until next year to see if they return? Please advise. Thanks. No doubt treating now will help. Nests may not have active adults but they can contain developing larvae and pupae. By treating with Drione and then filling the holes with some dirt will enable you to get ahead of the problem big time. Now as explained above, there will always be some stages you can’t kill so don’t expect to be free of them next year. That being said, the problem will no doubt be a lot easier to work on if you do some of what’s required now. Was wondering, since the larvae grow in the ground, would laying down grub killer in the spring affect them at all before they actually turn into adults and come out? Unfortunately no. There are a few reasons. The first is that traditional grub killers are designed to get the grubs as they feed shallow. So these treatments aren’t getting deep enough. The Cypermethrin we recommend penetrates a lot deeper. Like 5-10 times as deep compared to granules. And this is important. Also, as explained in our Grub Control article, most people only treat grubs once in the new year which is not nearly enough. And it’s not even the best time to get Cicada Killers anyway with just granules. The main reason is that as our article above explains, the cicada killers will be in their pupae stage as the new year rolls around. This means they’re in a shell which no chemical can get through anyway (the vulnerable larvae stage is active in the fall and early winter and then goes into it’s pupae shell for the winter). So as the last section of our article above explains, the only way to get them once the new year starts is to liquid spray from early spring on. Now if you treat with the Cypermethrin in the spring, it can penetrate deep into the soil so adult cicada killers that are emerging can be affected and killed. This can happen because when they come out in spring and summer, the process will take weeks and during this time they are weak and vulnerable. So if the soil has been treated, you can kill them before they ever get above ground and active. On a side note, the converse of what you were asking about will work on grubs. In other words, if you were treating for Cicada Killers like we explain above and started your treatments last fall, the treatments you did would have killed off any grubs in your yard. Of course, you would have to treat the entire yard and many times cicada killer treatments are restricted to a small area because that’s the only place you see them. But my point is the cicada killer treatments are highly effective on all grubs and no doubt the best way to get rid of them too. Are you sure they were cicada killers? I ask because this species of wasp will not get active until cicada’s are out which generally won’t happen until late May or June. So if you’re in the United States somewhere, it’s highly unlikely they were cicada killers. Now what is likely is that what you saw was some other species of wasp. They’ll commonly get inside homes in the spring as they become very active following the winter and this is in fact happening right now all around the USA. Paper wasps, golden wasps and mud daubers are the most likely species to get inside and all three can be repelled and controlled by using either Cypermethrin or NBS. I have cicada killer flying around my drive way along a rock wall. What should I do? I see them flying in and out of the rocks. Our toll free is 1-800-877-7290 and we’re open 8:00 AM to 7:00 PM Mon-Thur; 8:30 AM to 5:00 PM Friday and 9:00 AM to 1:00 PM Saturday, Eastern Standard Time. Call if you need more help. For the first time ever, we’ve seen these cicada killers flying between our neighbors yard and our driveway. We’ve only seen a couple. They tend to fly back and forth and sometimes go into the cracks in our concrete driveway. Would they have built nests in those cracks? We’ve searched our yard and do not see any of the type of nests you described. Please advise. Thank you! They love living under cement so yes, there is a high chance of nests being located under sidewalks, patio and driveway slabs. And when they nest in such locations, it can be tricky to treat them properly. I say this because many times there are small spaces under the cement which causes liquids to “reroute” and miss the nest altogether. These spaces and voids are quite normal and basically happen where the dirt settles or runs off over time following the installation of the cement. However, these voids will many times cause liquid applications to be ineffective. So with that being said, the best method to use through cement cracks is the Drione Dust. As the video we posted of what Drione looks like when applied (very smoky) demonstrates, its the only treatment that will blanket the underside of the cement and travel to the nest thus insuring you get the targeted wasps. So go with the Drione to insure you get good coverage when treating which in turn will knock them out for good. Hi. I have probably 40 – 60 of these wasps around my driveway. I have a retaining rock wall they have destroyed nesting in it. They push a ton of dirt out on my driveway and I’ll clean it up and the next day there is more dirt. I can’t pour things down their nests because its in the walls. I’m on my last nerve and have no clue what else to do. If you review our article above, you’ll see there is a section that shows how to dust for them using a dry product known as Drione. This method is 100% effective, works instantly and will not undermine the walls. The video in the article above shows how easy it is to do and no doubt, this is how you should handle this problem. Based on the amount of activity you have, I’d say the 1 lb jar of Drione will be enough. You’ll probably go through 1/2 to 3/4 of the jar but as you’ll see in the video, it only takes 1-2 seconds to treat each hole so its a very easy way to handle them. Now if you’re worried about getting stung, get a Bee Suit, Veil and Hat. This will protect you during the process and allow you to treat each nest anytime you want without the need to feel vulnerable or rushed. Hello, I’m in NJ and have about 20 active nests on my 1 acre lawn. At this time of the year what would be a better (more effective) product to control them – Drione or the Cypermethrin? My local garden center said to use liquid 7 and spray that in each hole. However I have not seen any results. Either option will work regardless of the time of year. The key is understanding that you need to kill them now, before they get eggs laid on cicada’s they hunt down and kill. But even after you kill the ones you see active right now you still need to liquid spray next spring and early summer to kill the hatching pupae that are no doubt in the ground developing. In fact, failure to liquid treat in the spring and early summer is one of the main reasons they’ll keep coming back. So dust or liquid treat now to kill all the active nests (personally I prefer the Drione dust because its so easy, fast and effective). Next, remember to liquid spray with Cypermethrin next spring/early summer so any hatching pupae die and by this time next year you’ll be cicada killer free. There are several wasps that will do this and they behave this way for a variety of reasons. And you are right; if you let them do as they want, your lilac bush will probably succumb to the attacks and die because they are stripping the plant away piece by piece. Fortunately there is a simple way to treat the problem. We have a unique product that can be sprayed over the entire lilac (or any other plant you want to protect) that will control all wasps and other pest that walk over or land on the treatment. 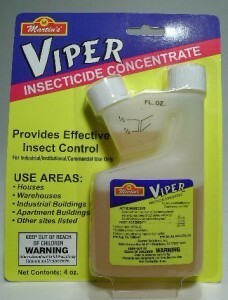 Mind you this product is not like most traditional insecticides which kill on contact. For example, the Cypermethrin listed above will not work for what you need. This is because Cypermethrin will only kill wasps that land on it so in the end, the nests will continue to live because they’ll just keep sending more and more adults to replace the ones you kill. But the one product we carry that’s perfect for your problem is special because it doesn’t kill on contact. In fact, it will take a good 2-3 days to start working. But this is very much by design. It’s also undetectable so the wasps don’t know they’re landing on a chemical. But when they do, they’ll pick up a little bit of the active and in doing so, bring it back to their nest where they’re transfer some of it to other members of the nest. And over the course of 2-3 days, the active will get spread around eventually getting transferred to most every member in the colony. This way when it does start working, the entire nest will die. Known as Optigard Flex, this odorless concentrate is easy to mix and apply. It will probably take a good gallon of mixed solution to do the treatment but it will work like nothing else can. Expect attacks and damage to stop within a week of the application being done. Also, Optigard is good for a wide range of pests like ants, termites and roaches. Its unique mode of action makes it ideal for hard to control pests that nest in communities with large populations hard to find. Can cicada killers be active in fill dirt? We received some fill dirt last year when we were re-seeding our yard. This year we have a large infestation of cicada killers. We never had the problem before. We’re wondering if the problem came with the fill dirt. In fact one of the most common ways insects are relocated is via fill dirt, sod, potted plants and other landscape related materials so yes, its entirely possible and frankly, quite possible. But its also possible that you had 1-2 nests last year which went unnoticed. As our article above explains, 1-2 nests will become 5-10 the following year and then 25-50 by the third year so problems can literally “explode” from one year to the next. The bottom line is that now would be a great time to take care of this issue by treating with Drione Dust and killing the active nests now. This would thwart the developing populous before you have an exponentially worse problem next year. 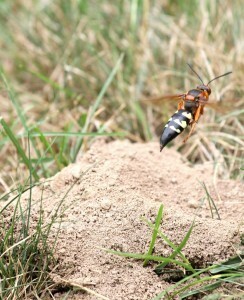 I have about 5 holes in the ground from cicada killer wasps. They are large and they look just like the pictures. Confused as to why I have them though because there are no Cicadas in Southern California (San Fernando Valley area of Los Angeles). I have lived in this house for 20 years and have never had them before. Was wondering how far down the holes are and where in that hole do they lay their eggs. I want to be able to kill the eggs as well so I do not have them back next year. Thanks. First, there are many “related” wasps to cicada killers and though the main species feed on cicadas, their closely related cousins will target other pests for food. In fact cicada killers will target other insects for food as well so their range will many times move into regions that don’t have active cicadas. But since they can adapt and find other food sources, they can no doubt thrive in these cicada free regions. So in your yard you could very well have cicada killers. But then again, it could be a closely related species that behaves in the same fashion. Either way, treatments are will be the same and effective regardless of what species they might be. Second, the main reason why anyone gets these wasps in the first place is because untreated turf is prime real estate for them (and pretty much any insect) to use for nesting. Basically these wasps target open landscaping so the turf around most any home is what they consider to be a “prime” nest site. And if you’re not treating your yard with some granules and liquid spray throughout the year, your turf will be subject to insect invasion. Now when we think of insects in the yard, no doubt we think of the common perimeter pests like ants, roaches, crickets and millipedes. But there are plenty of flying pests like cicada killers who can take advantage of the opportunity too and from what you’re describing in your message, it sounds like this has happened in your yard. Third, cicada killer nests will range from 1 foot to several feet deep (I’ve seen them 4-5 feet down), depending on the species, the type of ground they’re digging through, etc. And though “killing the eggs” is a great idea, this cannot be done. Simply put, there is no chemical strong enough to kill their eggs (at least none labeled for this pest in the ground) so the best approach available is what you see in the article above. And as you’ll learn from the info above, this approach is to dust the holes you see with Drione and then cap them off. The dust will last 6-12 months in the hole so that it will immediately kill any that hatch from their eggs or pupae. And it will also kill any active adults that might be using the holes at this time. Next, it would be wise to start applying granules and some liquid spray to the rest of the yard every 2 months to prevent new nests from forming. No doubt once a yard gets activity, the “scent” from the existing populous tends to attract more and more cicada killers which is why the problem will get worse from year to year. But this scenario can be prevented by actively treating your yard with granules and spray. And two that work well are the Bifen and Cyonara listed above. I just purchased the Cypermethrin and Spreader as well as the pump. Ready to go out tonight and spray the nest(s) that we observe today (looks like a couple right now). After reading all the comments, however, should I have gotten the Drione dust instead? Does it work better and more thorough? I was skeptical bout using the dust and feel more comfortable with the liquid, pump and extended hose. Thanks! No doubt most people are more “comfortable” using the liquid since its something they typically know and understand. And if you want to go this route, you can achieve success. Just be sure to use enough and to do 2-3 applications this year along with 1-2 next year in the spring and early summer to make sure they don’t return. Alternatively, the dust will yield longer lasting results with less effort. In most cases, just 1-2 applications will do the job and since it stays in the ground active longer, its sure to get hatching young. In the end, both options will work equally as long as you stay the course and understand that you will need to treat a few times when using the liquid which is a bit more compared to the dust. Are these safe for use around wells? Concerned about well contamination. If you have a shallow well, like 10 feet or less, I’d say don’t treat. But since most wells are 50-100 feet deep or more, there is no risk or potential for these products to get anywhere near the water supply unless you were to pour some directly down the well pipe. Basically our dust, granules and liquid materials can only go as deep as the nest and then another foot at most. But after that initial foot, they get filtered and broken down as the percolate down into the biomass. In the end, the chemical you apply will only penetrate maybe 6-12 inches beyond where you apply them. So if the nest is 3 feet down in the ground and you were to drench it, the active chemical would only get another 6-12 inches deeper. Deeper penetration will happen over time but the chemical will be vastly changed and no longer a “pesticide”. And dusts don’t go any deeper; they simply break down right away. Lastly, granules will penetrate another 3-6 inches at best since they have no volatility and are so weak. In summary, the risks of water contamination are pretty much non existent these days unless you have a really high water table like one might have along a coastal property (meaning if you reside right on a lake or ocean and you’re at the same water level). Coming up on two or three springs ago we discovered an infestation with C.K. Wasps. We tried local people and it was pointless every single time. Found you guys on google and bought the poison and sticking agent you recommended last spring. Used it this past spring/summer and the numbers dropped off drastically and quickly. So this upcoming season is going to be interesting. Hopefully I can eradicate them and start using the control products you sell to keep them away. I just wanted to say thanks. You guys were the only company that had a clue. Thanks for the kind words! As always, its good to hear from customers who are seeing results and on the way of reaching their goal. As for treating ahead of the problem this year? Definitely smart. Especially with certain pests like cicada killers. I say this because cicada killers typically have developing pupae deep in the ground. And since we can’t kill this stage, its very likely that some of these survived from last season and will be hatching soon with the arrival of spring and summer. And if any emerge this year you know what they’ll be doing? Laying eggs and starting new nests. So to make sure this doesn’t happen, get a treatment done 2-3 weeks before you expect them to get active. And then when the season starts, be sure to renew applications once a month for 2 months and you should be fine. In other words, this should kill off any hatching pupae as well as kill off any new ones that try to use this area for new nests. Now if you see activity at any time in between treatments and you notice the activity lingers for more than 5 days, treat immediately. We don’t want them gaining access to somewhere untreated and if they’re active for 5 or more days in soil that was treated a few weeks earlier, it means you need to renew the chemical. Follow these guidelines and after this season, your yard should finally be cicada killer free for good! We get these annoying little wasps each year on the hill in our front yard. We have used local companies to try and irradicate but each year the colonies and nests seem to multiply. Now that we are approaching the winter months, is there anything we can do to the nests to prevent or reduce the amount of wasps next summer? The only way we’ve been able to reduce them in the past is to actually kill the active wasps with a small tennis racket. My husband will spend an hour or so each day swatting at them with my sons spongebob tennis racket. I’ve even contemplated selling our home to get away from these pests. If you read the article above, you’ll learn about two products to apply which will stop the nests. I would think you should use both. At this time, do you see any holes from old established nests? If so, dust each one with the Drione Dust and then seal immediately afterwards. This will help by killing emerging eggs and active larvae feeding now. Adults typically die late fall and early winter but their young will be hatching and active. Treating now will interrupt their cycle by killing the larvae getting ready to pupate. But if there are pupae stages developing (which I’m sure there are), they won’t hatch until next spring. And you can’t kill them now since they’re so well protected in their pupae casings. But come next spray, they’ll emerge and when they do, new holes will appear. At that time, you need to dust again as the holes appear. Now if you don’t see new holes in the spring (March-April), then that means you did a great job with the Drione applied this fall. But I still recommend that you apply the Cypermethrin once a month to the area where the nests have been seen in the past. This will prevent new wasps from digging holes which will no doubt happen because your turf is “scented” as a good place to build nests. That means if you don’t spray before they get digging, you’ll have to deal with a new population next summer like you’ve been doing. In summary, there is not one thing you can do now to prevent any from appearing next year. But there is a good chance you do a lot of damage by getting developing young with the dust and then early treating with Cypermethrin next spring. Mind you these products are what professionals use and they will do the job if you get enough applied throughout the year. But 1-2 treatments will usually not be enough. We have seen where it will require repeated applications for established problems like the one you’re describing. Thank you for all this information! Last Summer we had a few Cicada killers in our front beds (near our front door). An exterminator treated. Unfortunately, this year we have around 20 flying around our front door! The beds where the Texas-sized pests are congregating are full of Purple Queen ground cover and finding the holes is not possible. I also must admit I’m afraid to get that close! Can you make recommendations about a comprehensive plan to kill them this year and prevent their return? Follow this process and you should knock them out this season and in turn, shut down their developing nests so you won’t have them getting active next season but if they do return, follow this process and you will eventually get rid of them for good. I just dusted upwards of 20 nests last night. It definitely worked wonders. As I am still in the active season, I’d like to know what the best product is to start getting ahead of them for the following year? What is the best product to broadcast over about 7,000sqft. Also, what do you recommend for follow-up treatments in the long term? Finally, this is the most informative site on the net! Thanks for what you do. Thanks for the feedback and sharing your experience! No doubt the Drione Dust is awesome. 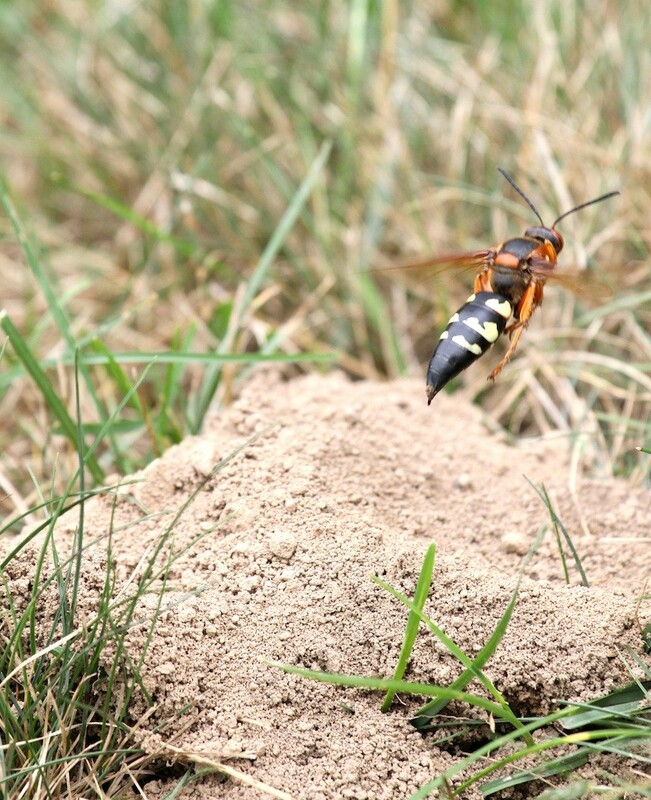 For quick control of ground dwelling wasps like the giant Cicada Killers, its awesome. Thanks so much for your information on digger wasps. I had the all over my lawn and tried everything. Your suggestion to use Adonis2F worked incredibly well. It totally wiped out all the annoying wasps. I have my yard back. We’ve had these wasps for a few years invade the beds around our front walk. Each year they’ve gotten worse. Hadn’t found anything that would get rid of them until now. Your site gives me hope! There is so much good information on here I’m a bit overwhelmed. I want to use the most effective product for the time of year. It is mid-April. These guys are going to start emerging probably around early June. What product do you recommend putting down now that will kill them at this stage before they emerge? Thanks so much for the info! As our article above explains, right now the stage in the ground is the pupae which is impervious to chemical and in general, too deep to reach anyway. That being said, treating as much of the yard with the Adonis would be smart. This could in turn “intercept” them as they come out in another months or so. Treatments will last several months and will control a range of other pests too like grubs, ants and more. Second, get some of the dust so that when you start seeing holes, you’ll be prepared to dust them as soon as they appear. Remember, holes dug out by emerging adults might be abandoned by them but due to the smells and scents active in your yard, these same holes can become a new home for others in the local neighborhood looking for a good place to live. Dusting will eliminate this from happening. I have been reading your website. Lots of good info. We saw about 4 or 5 of the cicada killers last year. We have them again. I am petrified to try anything on them and yet petrified that we will have more next year. Last year we saw the dirt they dug out and this year we don’t see it. Once they find a yard to nest in, they’ll dig holes, place cicada’s in the holes, lay eggs on them and seal them up. That’s the season when you’ll see the “dirt” they did out. The second year and every year thereafter until you treat them, the holes you see will be exit holes from the hatching pupae already in the soil. These new holes will not be dug nor will there be dirt since they’re coming out of the ground. Now if you start dusting them as our article above details, you’ll kill them off and the scent thus ending the cycle. But if you let them be, expect the problem to only get worse in the coming years.